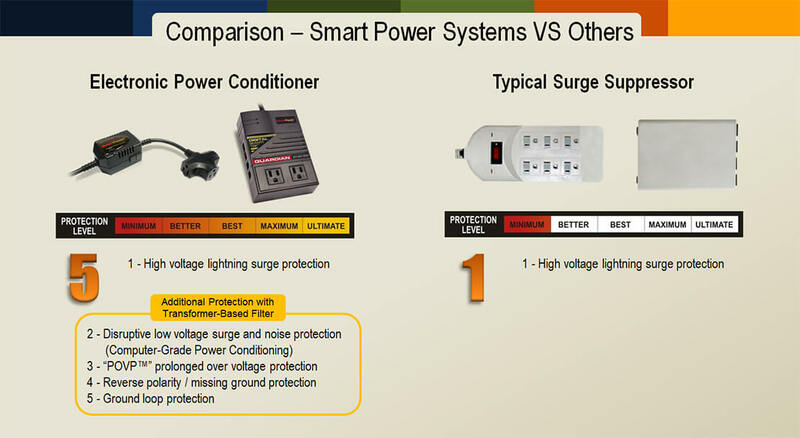 There’s a reason surge suppressors are low cost protection products, they handle a small percentage of power related problems. They worked well prior to electronic manufactures going fully digital with sensitive microprocessors now being the heart of electronic equipment. In the past, lightning and high voltage surges were the big concern. Now it is low voltage spikes that travel on the ground wire and enter the processor creating disruption and failure on an everyday basis compared to the occasional lightning strike. Microprocessors use the ground wire as a reference point for all commands; where a spike of 2 volts can change the command, creating a new command code your equipment does not recognize, thereby disrupting operations. Smart Power Systems Transformer-Based Filter technology offers a low let-through, providing Computer-Grade Power and a more stable power source for today’s microprocessor based products. Click here for more info on Computer-Grade Power. If you’re a dealer for Security Products, Office Equipment such as Digital Printers, Wide Format and 3D Systems, POS Systems, Digital Signage, ATM’s, Gaming Machines, Home Theater and Audio Visual Equipment, you’ll benefit from Smart Power Systems patented products that are specifically designed for today’s sensitive electronics. PreviousPrevious post:Service Techs Chasing Ghosts?NextNext post:Testimonial – Electronic System Products Co., Inc.